Smart Thinking Lifestyle Tips: Save Money On Groceries! Thanks to Tervis for sponsoring my writing. Visit their website http://www.tervis.com to learn more about the world’s first smart cup. How much did you spend at your last trip to the grocery store? $10? $100? $300?? Grocery shopping can be expensive. An average bi-weekly grocery shopping trip can easily top two or three hundred dollars. Even more, going to the store over and over throughout the week to pick up forgotten items can really add up. A few years ago my husband and I sat down and did a family budget. 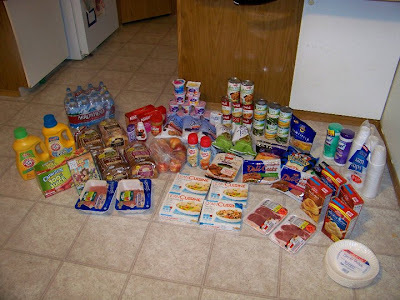 When we reviewed our expenses we were shocked that we spent so much on groceries and fast food. To save money, I decided to start planning all of our meals and shop with a grocery list...and STICK TO IT! I am going to share my process with you today. It has saved my family thousands of dollars just over the last few years. To start, if you shop at one specific place go through their weekly ad for the really good deals and plan your meals around this. For example: when Albertson's does BOGO on their meat you can plan your dinners accordingly. If you use coupons, search for coupons that match the sale items to save even more money. I use www.coupons.com, and I also search The Krazy Coupon Lady database. You don't have to do this, but it can really save money. Make a menu for the pay period. Plan out every meal, including snacks. You can use a chart like THIS one from the Tip Junkie website, or you can make your own. You can even go the easy route and write them down on a piece of paper. To make things easier, plan on using every meal twice during the pay period, or make large portions for leftovers. To make things fun you can designate one night a week to be "Breakfast for Dinner" night. We do this every Thursday. It makes the menu easier to plan and guarantees and inexpensive meal. Write down the ingredients you will need for your meals. These will go on your grocery list if you don't already have them in the house. This seems like a "duh" statement, but I can't tell you how many times I have been in the middle of making something, realized I forgot the ingredient, and ordered a pizza. Make a grocery list and keep it organized. I make one list for food and one for non-food items like toilet paper and tin foil. This makes maneuvering through the store easier. If you know where you are going you are less likely to browse ans buy things you don't need. Stick to your list. Getting everything you need in one trip will save you extra trips to the store where you KNOW you will buy more than just that stick of butter you needed. Estimate how much you will spend and only bring that amount in CASH. The thought of going over at the check out is enough to keep my impulse shopping in check and I usually come out at least $20 under budget. This is a picture from a successful shopping trip last winter. I got all of my groceries AND Toy Story 3 for $100. Also, since most Target stores have groceries, find coupons online for general Target merchandise, including food. I was selected for this sponsorship by the Clever Girls Collective. To learn more about Tervis, visit their website http://www.tervis.com. We have recently started grocery shopping with cash and it has made a big difference in the amount we spend, plus there's less waste! I walk the aisles adding things in my iphone...I'm sure I look dorky, but its worth it!